Only one mobile number can use cellular data at a time. Desde la pantalla de inicio, ve a: Settings (Configuración) > Cellular. This option is only available when both the physical SIM card and eSIM are activated. Tap the number you'd like to use cellular data. 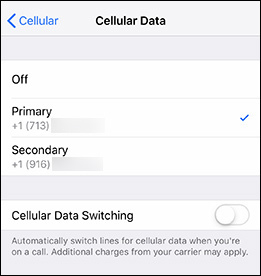 If desired, turn Cellular Data Switching on to allow your phone to automatically switch the Cellular Data number while on a call. Para obtener información adicional, consulta esta Artículo Apple.